International leaders, political allies and enemies alike marked Taoiseach Enda Kenny's departure as Fine Gael leader last night. 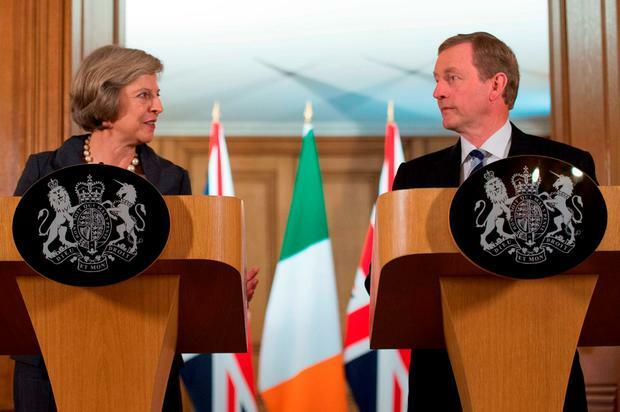 British Prime Minister Theresa May said Mr Kenny has been "a strong and consistent friend to the UK. I wish him all the very best for the future." At home, Fianna Fáil leader Micheál Martin praised Mr Kenny's commitment to public service. "While over the years we have had our differences on many political and policy issues, I have always appreciated Enda's decency, good humour and approachability". He wished Mr Kenny and his family well. Sinn Féin leader Gerry Adams did the same but was less generous in his subsequent remarks claiming that Mr Kenny had entered office in crisis, and was "leaving in crisis". He criticised the Government's record on Northern Ireland and other matters and said: "Having said that we all do our best and he did his best, so good luck and bon voyage." Scottish First Minister Nicola Sturgeon offered Mr Kenny her "best wishes", saying she enjoyed working with him at the British/Irish Council and said "he has always been a good friend to Scotland". EU Commissioner Phil Hogan said he was honoured to have served under Mr Kenny, who he described as "the greatest taoiseach of the modern era. He led Ireland from ruin to economic recovery". Fine Gael Deputy Leader James Reilly said he believes Mr Kenny has "proven himself to be one of the outstanding politicians of this century and the last". He said he rebuilt the party from the ashes of 2002 and brought the country back from the brink of financial ruin. Mayo-based Senator and the Taoiseach's former campaign manager Paddy Burke said Mr Kenny "electrified" Fine Gael after he became leader. "He can look back on his legacy with great pride. History, in my view, will be very kind to Enda Kenny," he added. Another Fine Gael Senator Gabrielle McFadden said she is "gutted" at Mr Kenny's announcement. She remembered his kindness to her late sister Nicky, who sadly died from motor neurone disease in 2014. "He was Taoiseach when my wonderful sister was a TD and he was exceptionally good to her... I very firmly believe that the history books will look back on this man as being the finest taoiseach this country has ever had."